Home / Patterns / Announcing Blooming Hearts Candle Mat! Announcing Blooming Hearts Candle Mat! 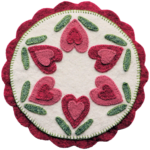 With Valentine’s Day just around the corner, I am excited to announce my newest candle mat pattern – Blooming Hearts. It’s simple, quick to make, and sure to bring warmth to your home. A fine gift for the people closest to your heart.